Mining Stock Daily is a brief overview of finance and resource exploration news from the world's mining and metals sector. Mining Stock Daily is a quick overview of the day's most important sector information for both precious and base metals, including market trends and analysis. The partial US Government shutdown has halted federal review of the Pershing Gold and Americas Silver merger after both companies receive shareholder approval. Integra Resources hits expansive results at DeLamar in Idaho. Vista Gold reports on new Met testing results for Mt Todd. IAMGold and Vanstar share new drill results from Quebec. Royal Gold provides sale numbers. Endeavor reports a 7% shortfall in 2018. Tinka Resources files a new 43-101 resource report. Mining Stock Daily is produced by: www.clearcreekdigital.com www.investmentresearchdynamics.com Disclaimer: Mining stock daily and its affiliates are not responsible for any loss arising from any investment decision in connection with the material presented herein. Yesterday's trading on the GDX pulling it back to its 200-day moving average and closed above it. Pan American shareholders have approved the acquisition of Tahoe. K92 shares its PEA at Kainantu, and exploration drilling with big grades from SilverCrest and Strikepoint Gold. Mining Stock Daily is produced by: www.clearcreekdigital.com www.investmentresearchdynamics.com Disclaimer: Mining stock daily and its affiliates are not responsible for any loss arising from any investment decision in connection with the material presented herein. On today's episode we discuss the losses in both the $HUI and $GDX from Monday's trading, we have our first merger of 2019, Kirkland Lake announces its 2018 gold production numbers, Osisko Gold Royalties announced it has repurchased $7.4 million worth of shares, Osisko Mining hits "Bonanza Grades" at Windfall, commercial production begins at Harte's Sugar Zone and Granada Gold identifies new intersections in Quebec. Mining Stock Daily is produced by: www.clearcreekdigital.com www.investmentresearchdynamics.com Disclaimer: Mining stock daily and its affiliates are not responsible for any loss arising from any investment decision in connection with the material presented herein. Sandstorm has recorded record gold sales from 2018, the Mining Stock Journal shares which royalty companies it has reported as "buys", Cobalt 27 acquires a new royalty in Australia, Energy Fuels produces its first Vanadium concentrate since 2013, Auryn identifies a new copper-oxide zone in Peru, and Gold is back up this morning in early trading. Mining Stock Daily is produced by: www.clearcreekdigital.com www.investmentresearchdynamics.com Disclaimer: Mining stock daily and its affiliates are not responsible for any loss arising from any investment decision in connection with the material presented herein. Junior Miner Junky, David Erfle, discusses his outlook on silver and gold this early part of 2019, a few companies he's really excited about this year, and how both gold and silver re-positioned itself over the holidays. The Mining Stock Journal provides some current analysis on the GDX and the previous bull cycle of metals. Through the December 31st close, the GDX has risen 20% since hitting a 52-week low close of $17.57 on September 11, 2018. Sokoman Iron Ore provides an update on financing. Honey Badger received an exploration permit at Thunder Bay. EMX Royalty (TSX-V & NYSE American: EMX) CEO, David Cole, shares the story of building EMX, where the idea for its business model was developed, early challenges and successes, lessons learned along the way, and company goals heading into the New Year. EMX Royalty Corp provided a thorough updated to their global asset portfolio this morning, Endeavor Silver hits new high grade silver and gold intersections in Mexico, Lumina Gold completes a round of financing, Aztec Minerals shared an exploration update from the Tombstone Project, and First Vanadium hits high grade vanadium at Carlin. Goldcorp partners with IBM's Watson to develop new technology, new drill results from Cartier's Chimo Mine, Barkerville's $19 million financing, and Treasury Metals shares an update on their financing terms. In today's mining and exploration news:: Leagold Mining announces the restart of the RDM mine in Brazil, Eldorado Gold updates its reserve and resource estimates, Azucar Minerals share results from drilling in Mexico, Silvercrest releases an updated 43-101, and Tudor Gold shares its last drill hole result. On today's Mining Stock Daily, we play an in-depth interview with the CEO and President of Brixton Metals, Gary Thompson. Gary speaks a lot about their Atlin Project and outlook on this project based on historic exploration. He also talks specific of the cobalt and kimberlite developments at the company's Langis project. Brixton Metals trades on the TSX-V: BBB and the OTC: BXTMF. The Mining Stock Journal has strong buy on Brixton. In today's news, Mineral Mountain is utilizing directional core drilling at Rocheford in South Dakota, Kootenay Silver set to acquire the Columba silver project, Dolly Varden shares new drill results out of the Golden Triangle, a new announcement from Northern Dynasty's Pebble Mine, and Great Bear now owns 100% of the of Dixie project. Abitibi Royalty announced a new NSR agreement with Renforth, ATAC Resources shares new exploration results in the Yukon, and new Sokoman drill results labeled the project a "Bonafide deposit." Bravada Gold and Oceana come to terms, Minera Alamos continues work with Divisadero, EMX repays a loan, more drill results from Fireweed and Regulus, buybacks at Sandstrom, and new updates from Paramount and Brixton. In M&A activity, Pan American is set to acquire Tahoe Resources while Premier Gold makes a strategic move in the Carlin Trend. Excelsior and Mag Silver also provide operational updates. Mining Stock Journal writer provides some commentary on recent gold buying, Talon Metals produces a new PEA, Fireweed Zinc has more drill results from Yukon, and Euro Sun makes strides in Romania. Today in the mining news headlines: Seabridge announces a private placement, Awalé Resources announced extensive gold in soil anomalies and Bayhorse files a NI 43-101. This week's corporate interview welcomes John Seaberg, Executive Chairman of Paramount Gold Nevada (NYSE American: PZG). Paramount is developing the Grassy Mountain gold project in eastern Oregon. We talk a lot about working with the state government, the project's resource, and also ideas with their Sleeper project in Nevada. Integra Resources intercepts more high-grade at Florida Mountain, GMV Minerals announces a positive PEA, Tahoe Resources shares their Q3 earnings, along with a large number of other companies in the sector. Barrick and Newmont discuss combining their Nevada gold mining operations, Kirkland Lake hits news mineralization in Australia, Contact Gold creatively raises money, US Gold will have the ability to raise money, Liberty Gold extends drilling, Fireweed Zinc and Paramount Gold acquire new mining claims. Energy Fuels says its waiting for higher uranium prices to sell its inventory, Americas Silver increases on production and still reports a loss, Galway Metals and Alamos Gold both share new exploration drilling results. In today's news, Hudbay acquired Mason Resources, Excelsior Mining enters into a new financing package, Revival Gold hits new intercepts at Beartrack, and Aurelius announce new drill results. EMX Royalty cashes in from its sale of Malmyzh, Aloro closes a private placement with active Agnico, GFG begins drilling at the Pen Gold Project, and First Quantum announces positive Q3 financials. In today's rundown of mining news we discuss gold futures contracts from the closing of the previous week, a new discovery for Minera Alamos in Mexico, new drilling results from Osisko Metals, an interesting land acquisition adjacent to Pueblo Viejo, and Ely Gold Royalties expands their portfolio. On today's news rundown of mining and mineral exploration news, we look at Barrick's Q3 financials. Pan American, Sun Metals and Almaden advance exploration programs. B2Gold increases their resource estimate at Fekola. Vista Gold and Minera Alamos agree to extend the due date on option payments. And a very special birthday wish. Zijin is a few steps closer to finalizing the acquisition of Nevsun, Pacton makes strategic moves in Pilbara, JOGMEC extends work with Mundoro, drill results from Marathon Gold, Banyon Gold and Lumina Gold. Premier begins its underground drilling program. On Today's episode briefly talk about the early morning spike in the gold price, production results from Hecla, new drill results from Osisko Mining and Margaux, and financing news from General Moly and Vendetta. On today's episode, we take a look at last week's move in the gold price, Garibaldi announces a third discovery, IAMGOLD shares some new drill results and Newrange Gold closes a non-brokered private placement. Today on MSD, a number of companies share updated exploration drill results, including Minera Alamos, US Gold, and Corvus Gold. Xanadu is now officially dual listed. Alio Gold updates their resource estimate at Florida Canyon. On today's episode we share news about Alio Gold reducing their debt, Harte Gold achieves first gold pour, BHP buys more into SolGold, Contact Gold has a new development at Pony Creek, and Treasury Metals updates their 43-101. Today's news consists of production updates from First Majestic, SSR and B2Gold, Great Bear discovers new ultramafic rock, new drill results from Golden Ridge, and a couple buy recommendations from the Mining Stock Journal. Today's in-depth interview comes from ATAC Resources Ltd. CEO, Graham Downs. He discusses current updates from the company's Rackla Gold Project in the Yukon, working with Carlin style gold, and also what shareholders can expect in coming months. Today on Mining Stock Daily we air an interview with David Erfle, the Junior Mining Junky, on due diligence and how to be a better investor in the junior mining space. In today's mining and exploration news, the Mining Stock Journal notes strong insider buying at Mineral Mountain, Integra Resources hits new high grades at DeLamar, drilling starts up at Grenada, more good news for IDM, and drill results from K92 and Zinc One. Kirkland lake announced record gold production, IDM Mining to raise $4.1 million, Aquila Resources receives payment from Osisko, and Trilogy Metals shares drill results from Bornite. Today on Mining Stock Daily, we share a few headlines out of the mineral exploration and mining industry and then jump into an interview with Nick "The Mining Book Guy" about some companies he's found successes with, some he has not, and the value of attending events such as the Beaver Creek Precious Metals Summit. A quick glimpse into the gold market, Gatling Exploration to begin trading, Pretium receives some aid to repay construction, new inferred resource from Orca, and news from First Cobalt. Today on the junior mining news, EMX Royalty days away from closing the Malmyzh sale, Aurcana shares an update from Colorado, Corvus has new drill results and Panoro Minerals announces a new JV with Japan. Today on Mining Stock Daily, Sokoman mobilizes 2 drill rigs, Premiere Gold announces new discoveries at McCoy-Cove, Mineral Mountain will begin Phase 2 drilling, EMX makes a deal in Australia and Paramount Gold shares updates from Oregon's Grassy Mountain. In today's mining and metals news, gold is down again today in early morning trading, Pershing Gold and Americas Silver merge, Bonterra shareholders receive ownership into Gatling, and why Contact Gold is a recommendation by the Mining Stock Journal. Dark Star continues to grow for Gold Standard, Osisko Gold Royalties will be out of a stream deal at Brucejack, Victoria Gold receives financing, Fission Uranium, Wolfden Resources and Aben resources share updated exploration results. Barrick and Randgold merge on $18 billion share deal, Iamgold and Dundee Precious Metals update their mineral resource estimates, Contact Gold and Integra Resources have new exploration results out, and Sabina Gold and Silver receive a key environmental permit in Nunavut. We are reporting from Beaver Creek, Colorado this morning and the Precious Metals Summit. Equinox moves into California, more drill results from Endeavor, Silvercrest and Galway update their resource estimates, and Great Bear revises its drill result. Bonterra shareholders approve an acquisition, Kirkland Lake takes a large position in Osisko Mining, and new exploration results from Marathon Gold, Orca Gold and Endeavor Silver. Lots of exploration highlights to share today. Today's episode rounds up news from US Gold, Defiance Silver, Bonterra, Brixton, Integra Resources, Strikepoint Gold and Benchmark. In today's news, Alexco has shared more drill results out of Canada's Yukon Territory, RNC doubles strike length, Global UAV received approval for BVLOS testing and the Mining Stock Journal has new ideas to share. Today on Mining Stock Daily, we speak with the co-producer of the show about some optimism in the market, the recent valuation of junior gold explorers relative to the spot price of the metal, and trends he'll be looking at through the remainder of the year. 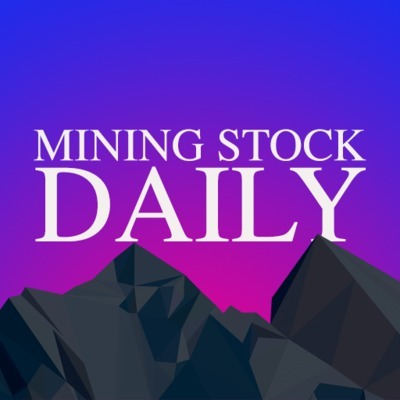 In today's Mining Stock Daily news recap, ATAC Resources announces high grade drill results, Barkerville's Cariboo Gold Project continues to strengthen, Cabral applies for a mining license, Silvercrest shares drill results and more mobilization in Newfoundland. How are mining companies utilizing these lower prices? We share some thoughts from the Mining Stock Journal. Also, news out of the Yukon from Triumph Gold's Freegold Mountain Property, GFG Resources, financing for Great Bear, and exploration results from Sable Resources. Today, we provide a quick summary of Friday's Commitment of Trader's report, updates from Tahoe Resources, and exploration news from Golden Ridge and Southern Silver. Levon Resources gets creative with their shares, Coeur Mining moving with Silvertip, a strong buy rating from Mining Stock Journal, and lots of exploration results out, including updates from Contact Gold, McEwen, White Gold and Marathon Gold. Today on Mining Stock Daily, Nevsun announces terms for acquisition with Zijin. Drill results from Osisko, Corvus, Revival, Wallbridge and Equinox are out today. And we share highlights from Golden Minerals new Preliminary Economic Assessment report. Lots of news to cover today from the junior mining and mineral exploration sector! Dalradian looks to close their transaction, Tahoe Resources see little help from the Guatemala's constitutional court, 92 Resources in an option agreement with Osisko Mining, Golden Minerals sells a property in Mexico, and US Gold corp begins targeted drilling at Keystone. Today we share some M&A activity, an updated 43-101 from Endeavor Silver and a look at the current status between Detour Gold and Paulson and Co.
Sokoman and Honey Badger provide updates assay results from their drilling programs, Mineral Mountain completes its 7th drill hole, Equinox Gold files a NI 43-101, and Endeavor addresses lower silver prices. Is Gold positioned for a sharp rally? Big financing agreements for Gold Standard and Evrim. ATAC and NuLegacy also in the news this morning. Balmoral acquires land in Ontario, Cameo Cobalts snuggles into the Golden Triangle next to Aben Resources, Cordoba announces a new JV, and a follow up on Great Bear from Friday. Collin Kettell of Palisade Global and New Found Gold joins us today to talk mineral exploration in Newfoundland, specifically the Moosehead gold district recently made popular by Sokoman. Lots of updates out of the mineral exploration and mining sector. Today we cover news from Great Bear Resources, Gold Standard Ventures, Regulus Resources, Trilogy Metals and more. Silvercrest begins trading in New York, Rosita strengthens its land position in Newfoundland, and more exploration news out of the mining industry today. Today on Mining Stock Daily: Orefinders closes its acquisition with Kerr Mines, SolGold shares an exploration update out of Ecuador, Sabina announces a significant discovery, and the Hedge Funds continue to show stronger bets against precious metals. Today on Mining Stock Daily, we speak with Dave Kranzler of Investment Research Dynamics about some historical context behind the current gold price and the selling pressure in the market. Trevor and Dave also chat one specific company their are keeping a close eye on during their fall exploration campaign. The spot price of gold shows signs of life, Grand exploration expectations in the Black Hills, and more news from Oceana Gold, Honey Badger, Skeena and Auryn Resources. The Moosehead Rush continues! More companies are extending land holdings in Newfoundland. White Gold, Sable Resources, Gold Ridge and Premier Gold all share new exploration results this morning after the gold spot price continues to fall. All this in today's Mining Stock Daily! Second Quarter Reports continue to be reported through the mining space. Today we pick a few key takeaways from Hecla, Torex and Aquila Resources. We also talk investor activity, moose pasture and uranium with Fabi from the Next Big Rush in our Friday interview session. A strong response from Nevsun's Board of Directors. News out of the Yukon, Brazil and South Dakota. We'll give you today's highlights from Cabral Gold, Mineral Mountain, Alexco and more! Today we discuss ongoing exploration programs from a couple "strong buy" companies according to the Mining Stock Journal. Brixton becomes the largest land owner in the Atlin Gold Camp, US Gold looks to prove a larger deposit in Wyoming, plus more headlines from today's mining and metals industry. Others explorers are riding the wave of momentum in Newfoundland. Who's picking up claims around the Moosehead Gold Project? We also chat the latest COT report, a shakeup at Nautilus Minerals and which Gold Royalty company Investment Research Dynamics has a keen interest in. With markets in Canada closed today, we briefly provide analysis to the downward movement of gold from the recent Mining Stock Journal report. We also provide an in-depth interview with Vista Gold Corp CEO, Fred Earnest, about its recent metallurgical testing results which has lead to a 90% recovery at Mt Todd. What is India doing with its recent gold imports? M&A activity continues to heat up, management moves from Treasury Metals, and who's reached 90% gold recovery in Australia. All in this episode of Mining Stock Daily! We've found a 5-bagger in this bear market! Who's the biggest mover of the week? We also share info of drilling results from today's news distribution. Kirkland Lake Gold shares support for additional reserves at the Fosterville Mine, Ivanhoe Mines' Kipushi mine in DRC is updated, Paramount Gold receives good news, and Freeport-McMoRan is granted an earn-in agreement with Mundoro. The hedge funds and the sentiment value of gold is presently in a bearish mood. What does this mean for the spot price of gold? Also, we talk recent announcements from Auryn Resources and Radius Gold. Today, Trevor speaks with Dave Kranzler of Investment Research Dynamics and the Mining Stock Journal to get his analysis on the bearish gold price and a couple companies he is keeping a close eye on. Today we share drill results from Barkerville Gold Mines and Gold Standard Ventures. We also provide a quick breakdown of the agreement between Novagold and Newmont. Today, we chat the latest news from McEwen Mining, Endeavor Silver and ATAC Resources. Today we talk Silvercrest Metal's continued high-grades at Babicanora Norte, Bravada Gold, Mexican Gold Corp, and a technology company with deep connections with mining and mineral exploration. What is the current contrarian view of gold? We talk that position, along with Hecla Mining, Viva Gold and the announced agreement between Bonterra Resources and Metanor. Today on Mining Stock Daily, we see a slight rebound in gold and other metals. We also play an interview I conducted with CEO of Vista Gold, Fred Earnest to talk about Mt Todd in Australia and its transformation over the past 2 years. Today on Mining Stock Daily, we discuss Metanor Gold, Impact Silver, and a look at the conversations which happened on Day 2 of the Sprott Natural Resource Symposium as we connect once again with Peter Bell. Today Mining Stock Daily talks about trends in gold, odd high volumes of a well known ETF, First Majestic, Silver Standard Ventures, Minaurum Gold, and we connect with Peter Bell from Day 1 of the Sprott Natural Resources Symposium in Vancouver. Today we talk about Nevsun's response to Lundin's takeover bid, Metanor Resources acquisition by Bonterra, big drill results form a number of different companies, and the bottom of gold. Today's Mining Industry news brings you updates from Fortuna Silver Mines, Golden Minerals, Bonterra Resources, Pershing Gold and more M&A activity in the sector. Here is your Mining Stock Daily news for Friday the 13th (July). Today we talk the decrease in gold price, Kootenay Silver, Hecla Mining and Premier Gold. In today's news, we share updates from Bonterra Resources, B2 Gold, and Skeena Resources. We also sit down with Viva Gold Corp CEO, Jim Hesketh, for more in-depth information about the company and its latest drill results in Nevada. Hedge funds bearish on Gold, Paramount delivers its PFS, Barksdale Capital begins exploration program in Arizona, and Silvercrest Metals finds high grade intercepts. Today on Mining Stock Daily we talk sector M&A, Goldcorp, Allegiant Gold, and Viva Gold Corp.